I believe it goes without saying who RE/MAX is (an acronym for Real Estate MAXimum , just learned now thanks to Wikipedia). 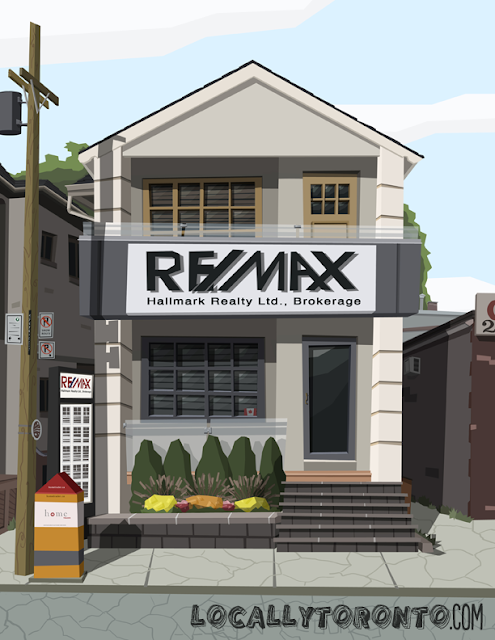 RE/MAX is constantly ranked as one of the highest selling real estate businesses. I was lucky enough to get to do an art-piece for one of their franchised offices in the Beaches. Located right on Queen St E and Wineva Av, it's in a prime location for local Beachers and Queen St East residence to go in and see what they're all about. Be it you're looking for a place to buy, to sell or a realtor of your own you will be in luck at finding what you're looking for at this location. There also is career opportunities for those who are looking to get into the real estate business themselves. No problem Sharon, thank you!